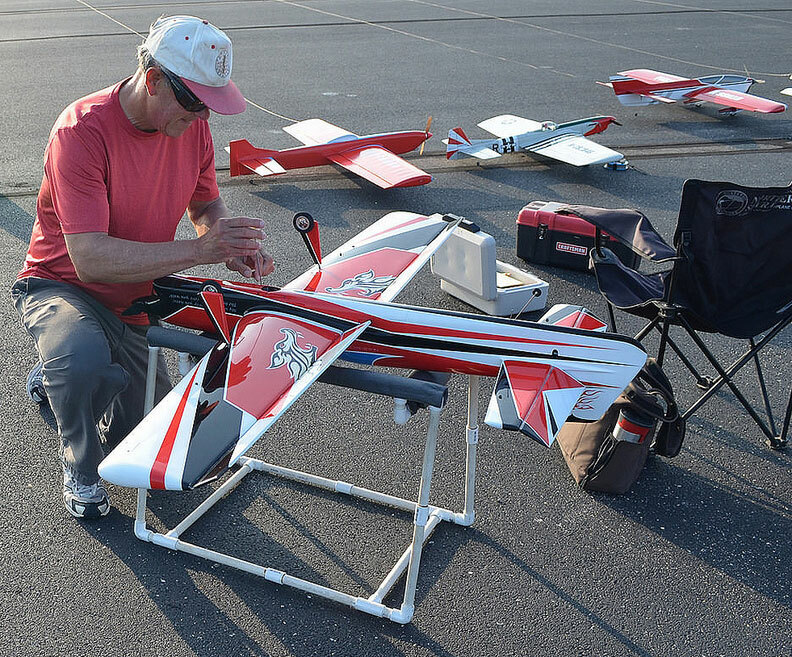 Paul Walker flew his 2015 Predator, seen here being prepared in the pits, to his 12th victory in Precision Aerobatics at the U.S. National Championships. Bob Hunt photo. Control line stunt at the 2015 US Nationals had something for everyone. The overall schedule was different this year and allowed for stunt practice many days before the start of the competition. Unfortunately, Mother Nature ruled on that and decided to rain a significant amount prior to most competitors' arrival. As a result, the grass practice filed was unusable early on. Beginner and Intermediate was held on Sunday on the grass field, and many brave souls drove out to that area. They had a successful competition, but at the completion, at least a dozen cars were stuck in the mud and a tow truck had to free them all. Shal and I drove from Deer Park, and spent three days on the drive. We stayed in Crawfordsville Friday evening and that left a two hour drive to get to Muncie on Saturday morning. Saturday morning I had a circle to myself. I put in nine flights (the total count of my charged batteries) in at best still air. The plane was not happy in that air, as it was much thicker than what I left in Deer Park. I decided that rest was in order after the three day drive, and headed to the hotel to check in. However before we left we visited with the few pilots there already. To my surprise, Howard Rush had arrived before I did! There were also Frank McMillan and Dave Trible flying, and most decided to pack it up and hit the diner. After lunch, we checked in and unloaded, recharged batteries, and took a nap. Then it was back out to the field. Mark Scarborough's new Impact on the flight line before its crash. Mark is from Pullman, Wash. Bob Hunt photo. It was totally different then. Nice soft wind, moderate temperatures, and rest made for a much better session. In the evening, I undid most of the changes I made in the morning, and it started flying very well. In reality, it was only a very small amount of extra tip weight different than what I had at home. I was satisfied with the results and went to dinner. Chris and Joan Cox arrived that evening, and checked in to the hotel. Sunday morning was once again nice. More people had arrived, and all were now on the L pad for practice. Bob Hunt was there with his new electric twin, as was Buddy Wieder. Both sported retractable landing gear that was cool to watch. Kaz Minato was also there with one of his nice Hellcat's. Once again, we spent the morning working on trim settings. The day was once again fairly cool for summer in Muncie. Lunch and rest and then again we went out in the evening for some nice conditions. But the nice air was about to change! 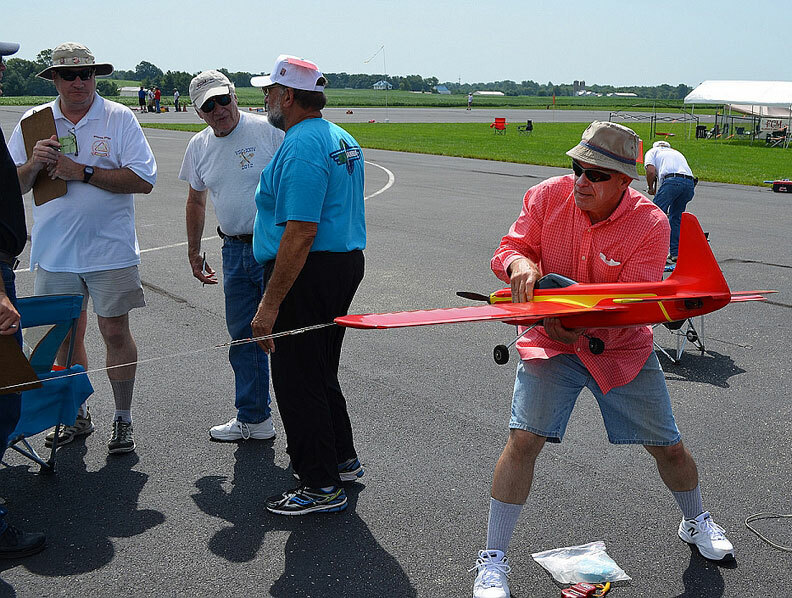 John Leidle of Kirkland, Wash., pull-tests his airplane. Bob Hunt photo. Monday afternoon is the pilots meeting and appearance scoring. It was set for 2:30 pm in the 180 building. Because of this, everyone goes out early on Monday to get practice, and then retires early to clean and polish their planes before the meeting. On this day, there were severe weather warnings posted in the morning regarding a storm front to pass around lunch time. Around 11:00 am, AMA officials combed the field warning everyone about the approaching storm. We immediately packed up and headed to the hotel. Unfortunately we came up a block short and the skies opened up on us as we arrived at the hotel. The winds also increased to 40 to 50 mph with the storm front. I parked behind the hotel to be protected from the wind and rain and got the plane out without getting it too wet. However, when I unloaded the tool boxes, I got soaked. Once up in the room, it was time to clean and polish. After a few hours it was ready and by that time the rain had stopped, but not the wind. Packed it up for the meeting and stopped for lunch at the Sunshine café. After finishing our lunch, it was off to the pilots meeting. 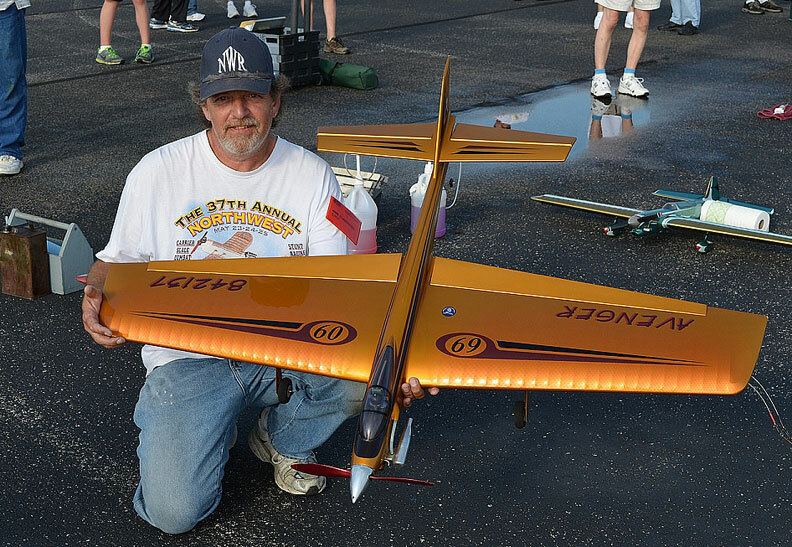 The planes were weighed and turned over to the appearance judges. This year Warren Tiahrt and Pete Peterson did the appearance judging. The pilots' meeting was held and the now famous ping pong ball draw for flight order was done. Once done, we were allowed to review the final placing for the appearance scores. Once again this year, I received 19 appearance points. Howard Rush, Chris Cox, David Fitzgerald, Brett Buck, and Orestes Hernandez all received 17 appearance points. The front row was 19 points and along with me were Kaz Minato, Todd Lee, and Gene Martine. It felt good to be 2 points a flight ahead of my closest competitors before a single takeoff. They noticed that as well! After the pilots meeting we headed out to the field for some more practice. I didn't fly, but was there to help Chris and Howard. That evening we had dinner with Chris and Joan Cox, Howard Rush, Brett Buck, and David Fitzgerald. A nice time was had! Howard Rush of Bellevue, Wash., puts in a flight. Mark Scarborough photo. The next day no official activities were scheduled, but Old Time and Classic was flown on the L pad as the Monday rain made the grass unflyable, and unreachable. This left two circles for all to use for practice. Normally this would be a problem, but on Tuesday the winds had kicked up and were approaching 20 mph. This thinned the crowd of people who wanted to practice. A few flights were put in, and we left as the weather forecast for the next few days had near perfect weather. One more session in the evening and we were ready for the competition to start on Wednesday. As predicted, the weather Wednesday was much better than Tuesday. However, the mild wind that existed had chop in it and made level flight bouncing around and made consistent bottoms difficult. My first flight had enough chop that I wanted to put a bag over my head so no one would know who flew the first flight. The second round improved, and I was ahead on my circle. Howard flew in hid=s group, and thought he did well, but found himself in third place behind Richard Oliver. Chris Cox continued to have a few issues that we had worked on in practice, and ended the day in fifth place. After the days official flying was over, Chris and I worked on some changes to help his score increase on Thursday. Things were made better. Rush carries his Walker-designed Impact to the circle. Mark Scarborough photo. Mark Scarborough also attended the Nat's, and his first day of Nat's competition was eventful. 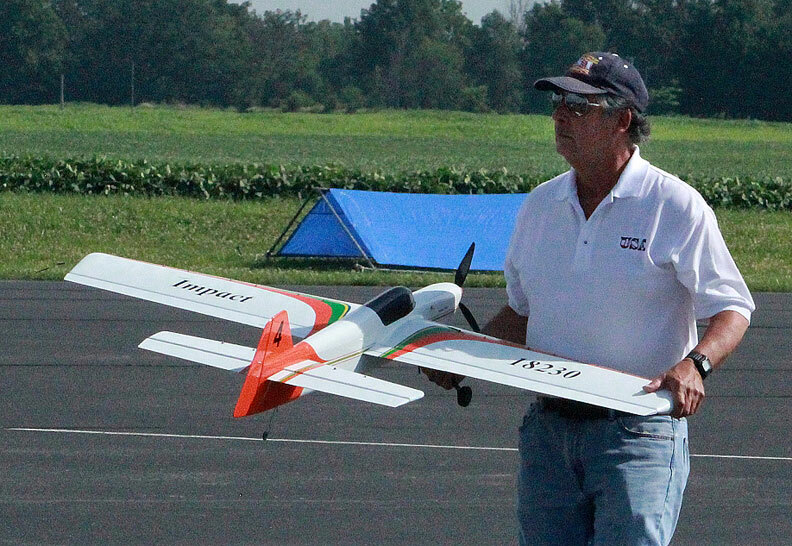 On his first official qualifying flight he took the plane out and set it in front of the judges. Just before the hand signal, he inserted the arming plug and nothing happened. He took an attempt. Back in the pits, we thoroughly scoured the system and determined that the ESC was at fault. He had no disconnect plugs on it, and had to take it back to the hotel to remove and replace the ESC. Once changed, he verified it worked, and headed back to the field. He fired it up several times to make sure it would work. Just before he went out to fly, he stated to Chris that things just can't get any worse. Well, you guessed it, they did. In his square eight the battery hold down straps let go and the battery and cowl were ejected from the plane. His plane ended up upright, but the nose pulled up, and it quickly did the fallen leaf imitation, right into the pavement. It broke the nose and broke the aft fuselage off. He ended up with a zero for this second flight as well. Undaunted, he brought out his Avenger for Thursday's flying. On Thursday, perfect weather awaited us. It was still as bit cooler than a typical Muncie summer, but most enjoyed that. 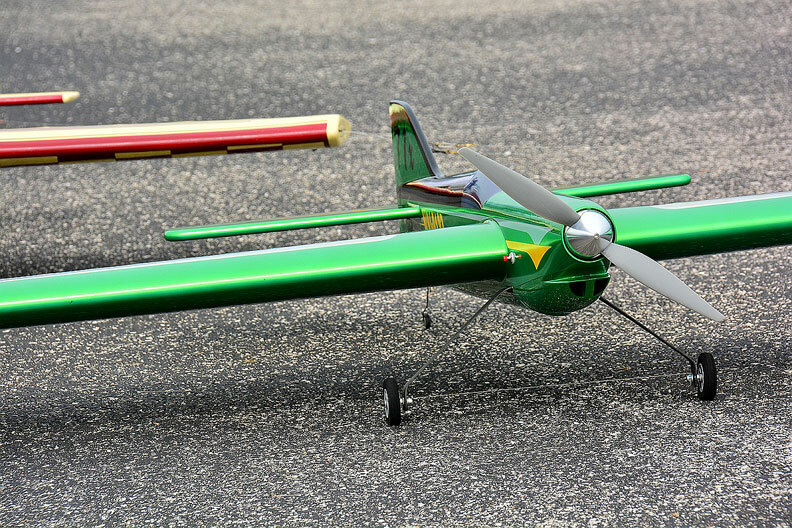 Myself, my plane worked better in the thinner air, and because of the weather forecast for Saturday, I didn't optimize the trim for the cooler conditions. On Thursday, my first flight was in near perfect air, and I posted the high score for the whole week of the Nat's. I elected to pass on my second round flight. Howard scored well again, but was still in third. Chris' first flight score was rather low, and he was not happy with himself. More time was spent adjusting and practicing before his second round flight. His second round flight was only one point less that Derek Barry's high score to that time. With that score, he was in fifth place and sitting on the bubble, and only five per circle advanced. He had to wait for over an hour before all the scores were in. In the end, he was bumped out of the top five, and failed to make the semi-finals. Chris held his head high, and continued helping me for the next two days. Mark Scarborough shows off his Avenger for Classic Stunt. Bob Hunt photo. As mentioned earlier, there was a variety of weather, calm, perfect, mild temps, wind, etc. Well, Friday where you fly two flights and add their scores together which allows for no mistakes was windy to the tune of 15 mph at the start of the day and was expected to build as the day went on. My flight order was ninth on circle four and eleventh on circle three. 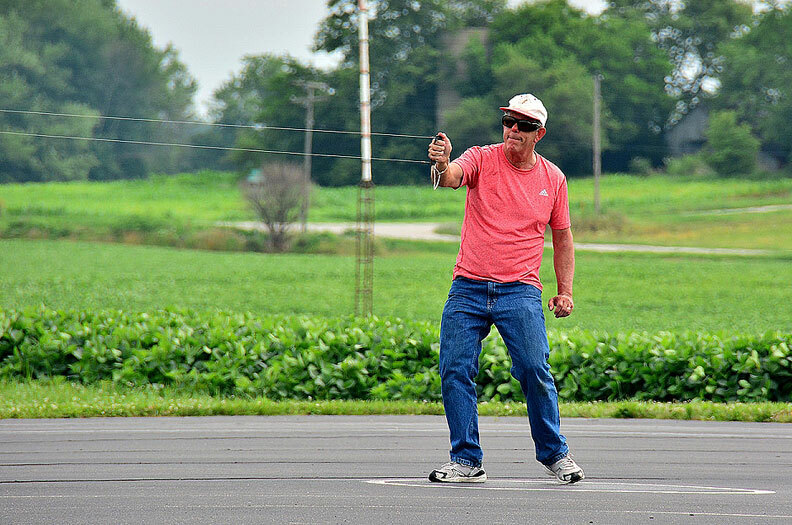 On my flight on circle 4, the wind was strong, but I was still able to do accurate maneuvers. By the time I got to circle 3, the wind became choppy and much more difficult to fly accurately. My score dropped on circle 3 compared to circle 4. Just after I rolled up the lines on my second flight another front passed and dropped a lot of rain. Flying was stopped and we headed to the diner for some lunch. Howard joined us for lunch, and he also has flown both flights and was figuring once the front passed, the wind would get stronger, and he would be in good shape. As we were sitting at the table eating, we noticed the wind had subsided and the rain stopped. They resumed flying as soon as the rain passed, and a few pilots got a break with lighter wind than most others had. It was just luck of the draw. In the end, the final five were Brett Buck, Orestes Hernandez, Paul Walker, David Fitzgerald, and Kaz Minato. Sixth went to Doug Moon, and seventh to Kenny Stevens. Howard ended up in tenth place. The forecast for Saturday was for the temperature to be the highest of the week, with steady four mph winds. That was just what my plane was set up for! On Saturday, I decided not to look at the scoreboard until all fifteen flights were done. My focus was on intense concentration for all three flights. The ping pong ball draw for Saturday's flight order gave me a good position. I was third in the first round, fifth in the second round and fourth in the third round. As the day proceeded, the plane just flew better and better as the temperature increased. My low score was in the first round, but was in second place after the first round. The sun was a factor in the first flight as the wind blew almost directly into the sun, and it was still not very high in the sky. David had a three point lead on me then. In the second round, the sun was higher and not a factor in my flight. I pushed hard and flew better. After the second round, I had the high score at that time, and was now ahead of David. In the third round, I did my best flight of the day, and put up the high score of the day. David was unable to come up with enough points in the third round, and I had won my 12th Nats title. 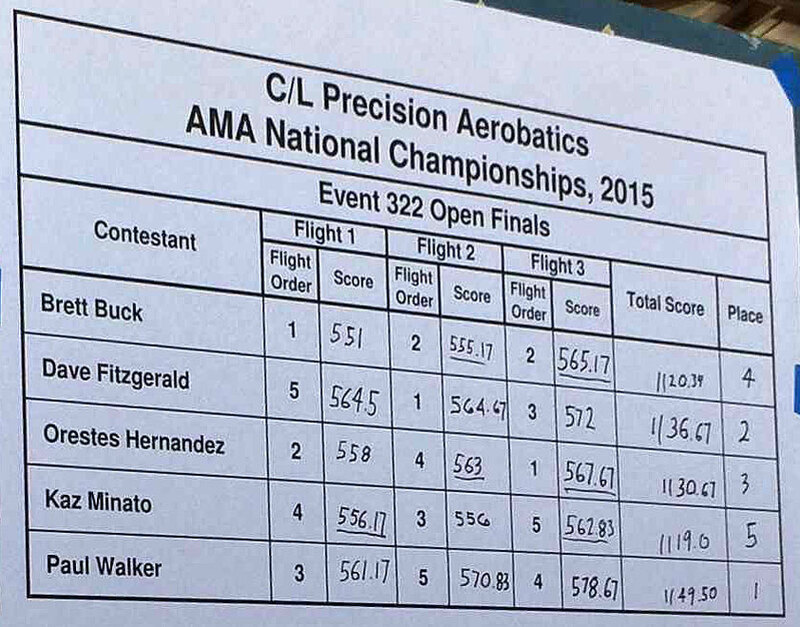 Walker puts in the winning flight at the 2015 U.S. Nationals. Bob Hunt photo. The Walker Cup fly-off followed shortly, and I scored enough to win the Walker Cup, again for the 12th time. I want to thank Chris Cox for his expert help in coaching me this year. He had big shoes to fill as Don McClave was unable to support me at the Nat's. Even though he wasn't there, I could still hear his voice in my head telling me to make sure to watch certain portions of some maneuvers. He wasn't there, but he was there in my mind! In the past, I have discussed the mindset of competition and winning. This year fit that description to a tee. After the first flight on Thursday, I knew I was going to win this Nats. I just had to keep a level head, and stay focused. I managed to do just that. I was at ease, and less nervous than in past Nats. A very enjoyable Nats for me, to say the least.